So half term was a week ago, seems like forever! Unfortunately for us it was not all good, there was illness amongst other bad stuff. So to help me, I thought I would write about a particularly lovely day we had! We had planned from the beginning that the Thursday of Half Term was going to be family day, we love spending time with other family and friends, but we wanted one day where it was just the four of us! Typically we woke up, opened the curtains and it was absolutely chucking it down! Hmmmm, do we really want to go out in the rain, seaside is out, Zoo – probably not as most the animals hide away, what to do, what to do? So I jumped on the internet and checked around, we found Stonebridge Farm, even better it is free to get in, hmm it is still raining outside though……oh well! C’mon kids, wellies on, waterproof on – we are off out! So we jumped in the car and headed off, we didn’t tell Legs and Mouse where we were going, we did however give them ‘maybe its the mushroom factory’ and ‘maybe its the boring centre’ along the way! Now Stonebridge Farm is a small City farm, yep it is right in the middle of the city, when we pulled onto the estate we weren’t sure we had the right place – there were houses and industrial office type building all over, but it was! It is small and we were only there for 40 minutes but the kids loved it! We bought some animal feed and visited the Ducks, Chickens, Goats, Pigs and more. Legs was laughing his head off at a goat ‘tickling’ his hand with it’s tongue whilst trying to get some food! After this we headed down the road to Greens Windmill, again in the city and again Free to get in – Yay! There is a small science centre attached where you can play with magnets, conduct power from yourself (the kids are far more powerful than me, must be my age!) or look in funny mirrors! 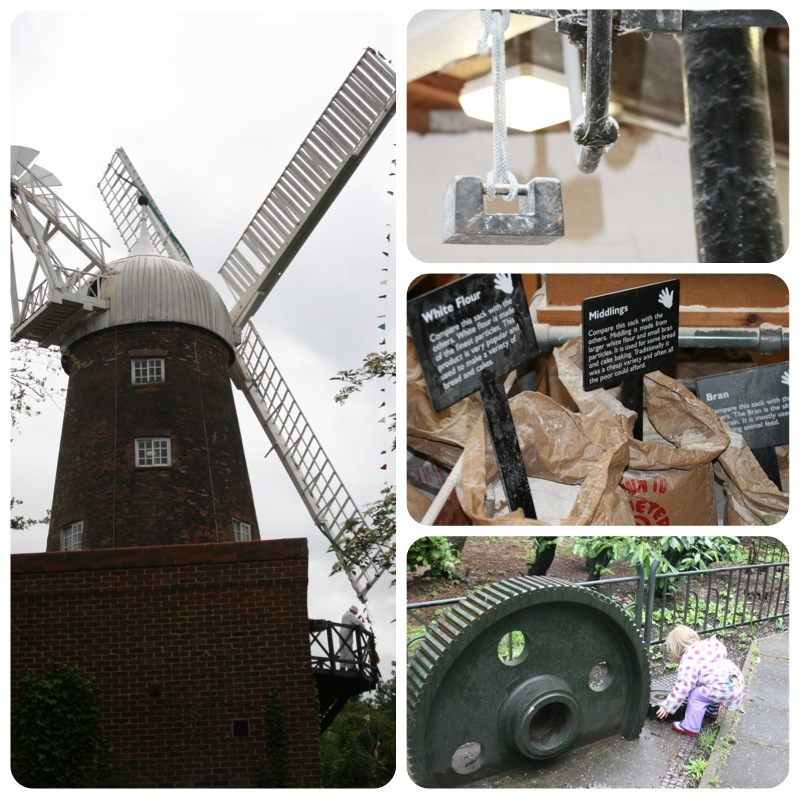 Then you can actually go into the windmill, it is a working windmill so you can see the real parts, the grain, the flour – everything, it is fascinating for the kids as they don’t see things like that all the time! Legs was telling us all about how it works (he has been with School before) and Mouse loved exploring! We topped the day off with a naughty lunch at a particular Yellow logo’d fast food restaurant, not somewhere the kids get to go a lot but boy, do they love it?! It was a fantastic day, the kids had smiles through it all! Brilliant! I love the farm park and using the feed, the children love It too. Glad you had a lovely day.